The limosa harlequin frog (Atelopus limosus), an endangered species native to Panama, now has a new lease on life. The Panama Amphibian Rescue and Conservation Project is successfully breeding the chevron-patterned form of the species in captivity for the first time. The rescue project is raising nine healthy frogs from one mating pair and hundreds of tadpoles from another pair. Nearly one-third of the world’s amphibian species are at risk of extinction. The rescue project aims to save priority species of frogs in Panama, one of the world’s last strongholds for amphibian biodiversity. While the global amphibian crisis is the result of habitat loss, climate change and pollution, a fungal disease, chytridiomycosis, is likely responsible for as many as 94 of 120 frog species disappearing since 1980. Between its facilities at the Smithsonian Tropical Research Institute in Gamboa, Panama, and the El Valle Amphibian Conservation Center in El Valle, Panama, the rescue project currently cares for 55 adult limosa harlequin frogs of the chevron-patterned form and 10 of the plain-color form. 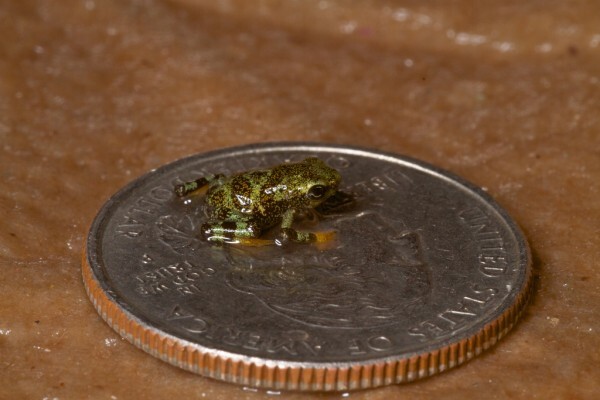 The project has had limited success breeding the plain-color form of this species, and has successfully bred other challenging endangered species, including crowned treefrogs (Anotheca spinosa), horned marsupial frogs (Gastrotheca cornuta) and toad mountain harlequin frogs (A. certus). Each species requires its own unique husbandry to thrive and breed. The project’s animal care team and scientists learn husbandry techniques as they work with a limited number of individuals. Jorge Guerrel, conservation biologist at the Smithsonian Tropical Research Institute, arranged rocks in the breeding tank to create the submerged caves that appear to be the preferred egg deposition sites for limosa harlequin frogs. Like other Atelopus species, tadpoles require highly oxygenated, gently flowing water between 22 and 24 degrees Celsius. The tadpoles’ natural food is algal film growing on submerged rocks, which Guerrel and his colleagues re-created by painting petri dishes with a solution of powdered spirulina algae, then allowing it to dry. The mission of the Panama Amphibian Rescue and Conservation Project is to rescue amphibian species that are in extreme danger of extinction throughout Panama. The project’s efforts and expertise are focused on establishing assurance colonies and developing methodologies to reduce the impact of the amphibian chytrid fungus so that one day captive amphibians may be reintroduced to the wild. Current project partners include Cheyenne Mountain Zoo, Houston Zoo, Smithsonian’s National Zoological Park, Smithsonian Tropical Research Institute and Zoo New England. This entry was posted in biodiversity, chytridiomycosis, ex-situ conservation, Partner project, Rescue and tagged Atelopus limosus, Limosa harlequin frog by Lindsay. Bookmark the permalink.